A Year of Being Here: Larry Schug: "Mending Mittens"
and the hoe and spade come out of the shed. Suddenly I find myself praying. repaired its threads of twisted waters. the tear between people and the rest of life. may our fingers not throb or go numb. continue all the mending that needs to be done. "Mending Mittens" by Larry Schug. No other bibliographic information available. 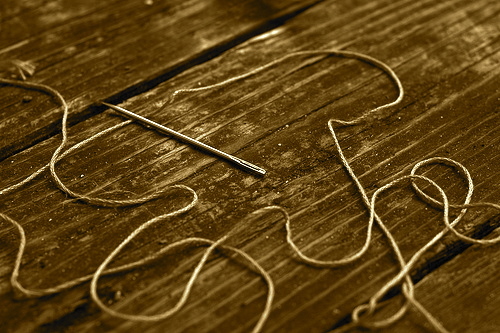 Photograph: "Silver Needle and Golden Thread" by CarbonNYC (originally color).